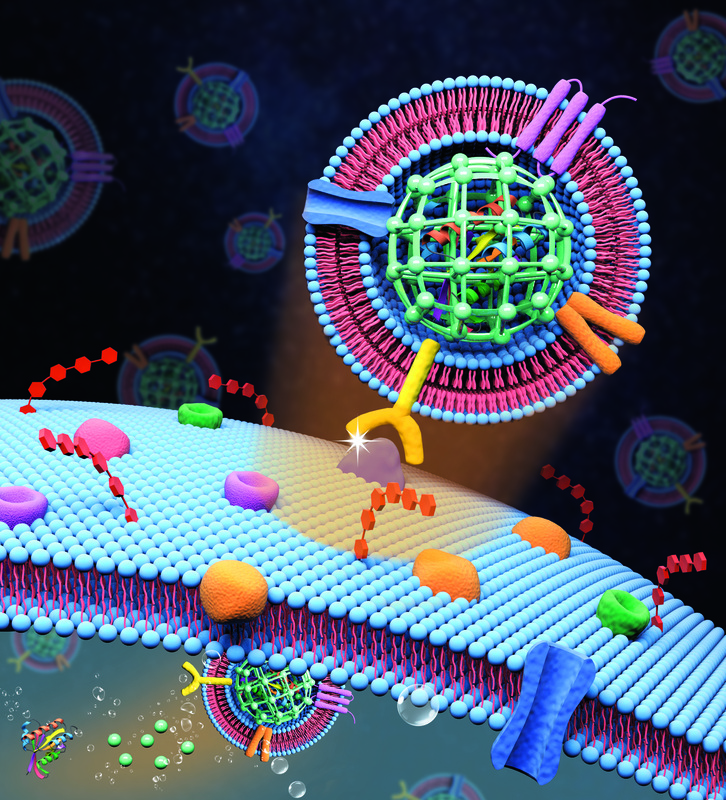 A team of Penn State researchers has developed a biomimetic nanosystem to deliver therapeutic proteins to selectively target cancerous tumors. Using a protein toxin from a plant found in the Himalayan mountains, called gelonin, the researchers caged the proteins in self-assembled metal-organic framework (MOF) nanoparticles to protect them from the body’s immune system. To enhance the longevity of the drug in the bloodstream and to selectively target the tumor, the team cloaked the MOF in a coating made from cells from the tumor itself. Blood is a hostile environment for drug delivery. The body’s immune system attacks alien molecules or else flushes them out of the body through the spleen or liver. But cells, including cancer cells, release small particles called extracellular vesicles which communicate with other cells in the body and send a “don’t eat me” signal to the immune system. The nanoparticle system circulates in the bloodstream until it finds the tumor and locks on to the cell membrane. The cancer cell ingests the nanoparticle in a process called endocytosis. Once inside the cell, the higher acidity of the cancer cell’s intracellular transport vesicles causes the metal-organic framework nanoparticles to break apart and release the toxic protein into cytosol and kill the cell. “Our metal-organic framework has very high loading capacity, so we don’t need to use a lot of the particles and that keeps the general toxicity low,” Zheng said. The researchers studied the effectiveness of the nanosystem and its toxicity in a small animal model and reported their findings in a cover article in the Journal of the American Chemical Society. 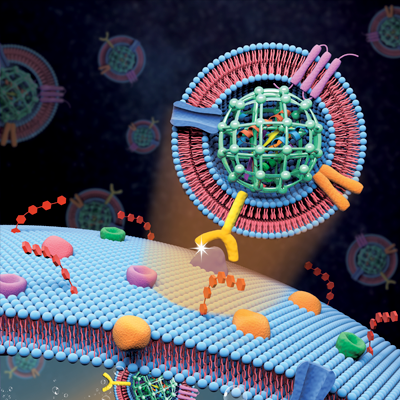 The researchers believe their nanosystem provides a tool for the targeted delivery of other proteins that require cloaking from the immune system. Penn State has applied for patent protection for their technology. Besides lead author Gong Cheng and senior author Siyang Zheng, co-authors on the paper, titled “Self-assembly of Extracellular Vesicle-like Metal-Organic Framework Nanoparticle for Protection and Intracellular Delivery of Biofunctional Proteins,” are post-doctoral scholars Wenqing Li, Xiaohui Han, Yuan Wan, and Zhigang Wang, graduate students Laura Ha, Sijie Hao and Xin Zou, all in Zheng’s group, and associate professor of biology Yingwei Mao and his Ph.D. student Fengping Dong. Their work was supported by Penn State’s Materials Research Institute and Huck Institutes of the Life Sciences, and the National Institutes of Health. Contact Prof. Zheng at sxz10@psu.edu.